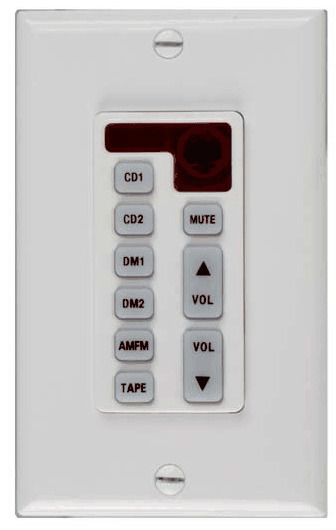 The MCS-1A Speaker Zone Control Keypad is designed as an in-room control for the MDS-6A Music Distribution System. In a typical installation, an MCS-1A (or MCS-2A) would be installed in each listening room or location to control the speakers in that zone. 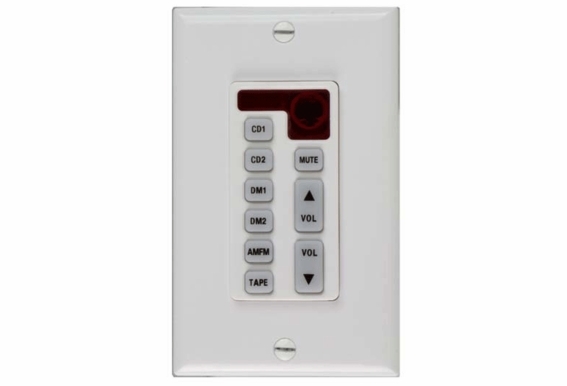 The MCS-1A mounts in a standard single-gang electrical box and is covered by a standard Decora® wall plate. The Model MCS-1A source keys are used to select which audio source device (CD, TUNER, TAPE, DVD, DBS, TV, etc.) will be played from its specific speaker zone. The speaker’s volume can be adjusted, or muted, using the keys on the Zone Controller. Any infrared remote control code sent to the MCS-1A from a handheld remote will be repeated to source devices through the MDS-6A. Two special features are available for each Zone Controller. The "whole-house-music" feature will play a selected audio source from all of the system’s speaker zones. The "do-not-disturb" feature prevents a speaker zone from responding to "whole-house-music" commands from other Zone Controllers and mutes any system wide pages to that speaker zone. The MCS-1A keys can light in three colors (green, red, & yellow) to show the status of the speaker zone. The optional key backlighting lights all of the keys with a pleasant green glow.